The Landscape of Attiki is changing due to the new infrastructure. Locations that used to be a Sunday trip are reachable in one or less hour. Locations formerly blocked with traffic are reached in a quarter of an hour with the metro. More and more people are using and change different means of public and individual transport, exploring new nodes and new rituals of movement. Infrastructure justify its importance in the Metropolitan landscape as example of the cognitive dimension of urbanism, appropriated in diversion of multiple levels of use and habit. The whole experience of the city is shifting. Watching the city enclaves from the highway, experiencing different scales in a short time through movement and exploring a rhizome in a metropolis which is expanding thanks to new displacements and connectivity, form the new territorial space of the everyday life. Marginal spaces out of formerly important nodes. Land that was produced by old rural grapevines. At the same time Athens is preserving a historic future. This sounds in contradiction with the unprecedented infrastructure lines cutting through the mountains, the former borders of Athens. A memory of ancient routes is barely present in the large scale plans associated with new canalization of flows, large scale consumerism and leisure, enchanting of the touristic attractions, new colonization areas, and new residential space. The way a historic future is directed is that the new routes empower and designate the shift of the economic centre along the highways, ‘cleaning’ in stages the former centre towards a ‘downtown themepark’. The assignment for the participants of Terraventure was to re-map the city of Athens according to an individual time-space trajectory. Four groups were directed to four locations with a common starting point, the National Technical University in the centre of Athens, and simultaneous starting time. Different technics were used, dividing distances up into small time slots. 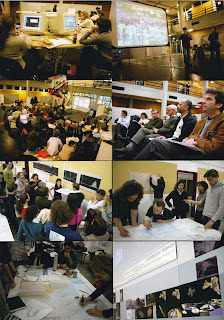 The groups were based on the 2d maps, their re-reading and marking by action, movement and transportation means, in order to create maps which don’t appear as an icon and a signifier of the apparent but as the signification of the mutation of the planned infrastructure to the momentary instability, mixture, shifting and personal drift. 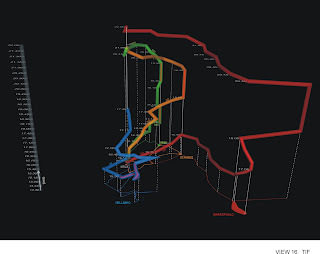 The product was time diagrams produced as new maps of Athens according to acceleration-delay, wandering, distances, transit points and intersections, real time and experienced time (duration). The second step of the assignment was to map the four locations themselves, with a cognitive localized map and a graph produced by stratified or intermingled time definitions. Athens, as an enormous and ever-growing web in space and time, hosts criss-crossing pathways, each one of these is a timeline. While clock time is continuous, experience time (duration) is an equivalent to a bubble that inflates and decreases. While clock time and experience time, despite their continuity or discontinuity, are going forwards, historic time gateways are making this web a multiple-experienced space, where time jumps back or forwards. James Burke reads this web as an abstract subspace, as a sphere at the centre of it is the ancient beginning. The surface of the sphere expanding and growing as every moment goes by, is the modern world. Extraordinarily, there are some pathways that link the modern world to the very ancient, central parts of the web. If everything, any individual has some effect, then as the massive high speed networks come to realisation, the product of this synergy with us will add up to infinitely more than the sum of parts. The journeys followed in the workshop are expected and unexpected paths, because of the combination of the planned canalization of flows and the individual stimuli. As a result, is the end product of millions of these kinds of serendipitous interactions of time, infrastructure and commuters, happening over thousands of years. ‘The only radical difference between human history and ‘natural’ history is that the former can never begin again. (…)This means that you pick up, and try to continue, a line of enquiry which has the whole background of the earlier development of science behind it;’  Colin Rowe and Fred Koetter understood the urban situation figuratively, through gestalt figure ground composition and historical montage. The city was seen as a collision of temporal planes, signifying a range of attitudes. Historical Geography nowadays is concerned with reconstruction and interpretation of spatial patterns of the past and their significance for understanding contemporary human landscapes. The characteristic of Historical Geography is the belief that conventional studies in Social History neglect the non-accidental association of most historical phenomena with specific places, environments and landscapes. And that place cannot be understood without reference to the dynamic restructuring processes binding the former to the latter. As Eviatar Zerubavel demonstrates in Time Maps, we cannot answer burning questions without a deeper understanding of how we envision the past. In an attempt to map the structure of our collective memory, Zerubavel considers the cognitive patterns we use to organize the past in our minds, the mental strategies that help us string together unrelated events into coherent and meaningful narratives, and the social grammar of space over conflicting interpretations of history. And this happens by constructing historical origins, by organizing time into stories. The first reported case of city walk as generic principle is of the 19th Century opium eater Thomas de Quincey, the prototype of the obsessive drifter. The surrealists in the 30ties, the Lettrists in the 50ties and the Situationists in the 60ties elaborated on this urge by transforming it into a systematic practice. The last developed the science of the dérive, the drift. These dérives were not random, but persuaded for the use of imagination to experience the urban surroundings in a new way. The typical flâneur in Athens gives his place to the explorer, the act of strolling to this of “signposting” as Manuel Gausa characterises it. Confronted with the simultaneity of different scales and the rapid shifting we are forced to create individual landmarks. Moving in the dynamic environment of the Metropolis includes a mapping itself. It is not a act alone but a thinking and creative process, a registration of experience. An interesting example of large scale ‘incidental maps’ is that of Louise van Swaaij and Jean Klare, two Dutch cartographers, that produced the 'Atlas of Experience' . The book shows a selection of maps reflecting human experience. For example, it includes villages named "Expectation" and "Wait", the Swamps of Boredom and the Airport of Escape. At the beginning of the 1st millennium, Julius Caesar put his son-in-law Agrippa in charge of a mapping project which resulted in the 'Peutinger table' in the third century. The Peutinger table was similar to today's London Underground map: it eschewed much geographical information and concentrated on information useful to the traveller: for example major roads were drawn as straight lines, with no scale or attempt to show their true course, however distances are written in, as are cities, temples, lighthouses, spas, bathing facilities, forts and imperial residencies. The geography is completely distorted, but the landmarks and distances would have proved useful to a medieval traveller. Time-space Convergence is a concept used in Historical Geography to denote the space shortening that takes place as breakthroughs in transport technology enable distant points to become nearer to one another. Each technological transformation engenders a revolution in travel time, thereby facilitating the ever wider spatial organisation of people and activities. At the same time Giddens speaks about time-space Distanciation as a feature of Modernity, though particular forces that shape locations are geographically distant. 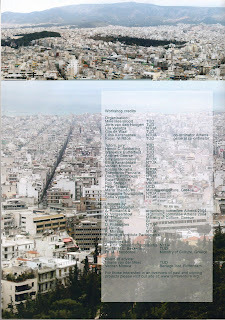 - There is planned infrastructure in Athens. And there are big scale left over places, places that appeared out of displacement (old airport) or connectivity (Stavros) or unplanned places-in-transition (Markopoulo). Due to their scale, there is mobility INSIDE them, a sometimes different one than the one to get there. Not in accordance with cardinal directions or determined vectors but in a “polyvocality of directions”. Here the forces move not in lines in a grid-like space but in spiral and vertical motions in concrete places. Motion in such space is not from point to point, not from location to another. - Example: the route of group 9, see FormZ non-linear paths. - Contradiction: what is design as cityscape - a node, an airport, land on the edge of becoming a plan - when freed from function, works with the mechanics of fluids. In the Dictionary of Modern Thought, the word ‘mapping’ cites the heading ‘function’. Maps are used to define and declare territory, and describe function relationships between that territory. Mapping an area involves learning about it. Not everything can be included on the map. How that distortion is made (what information is selected) depends on what the final map will be used for. The Map is thus NOT the Territory: and the map is self-reflexive (it becomes part of the territory). The mapping can be thought as a ‘black box’: one drops a number in, turns a handle and out comes a probably different number. To organise this you need a supply a formula, such as x2+2x- , in former times. 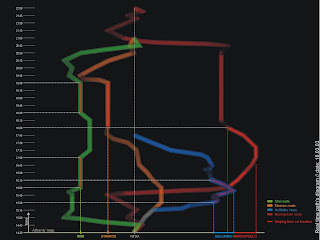 Nowadays it can operate referring to a graph. cognitive map, as an interpreting framework, presupposes that any interaction between a person and the environment changes also the knowledge or information about the environment. The term was first used in 1948 by E. C.Tolman, investigating behaviour understood through accumulation of incoming stimuli into ‘cognitive maps’, and later by Kevin Lynch investigating the urban situation understood through the cognitive map. However, the idea of cognitive maps dates back to 1913, where Trowbridge carried out investigations in cognitive maps, which he called "imaginary maps". Timeline is defined as a series of points that represents moments when someone or something is acted. The Situationist International used 'detournement' and the dérive to produce art works / performances and maps about the physical and psychological relationship between man and the urban environment. 'Detournement' (in English 'diversion') was plagiarism where both the source and the meaning of the original map was subverted to create a new map. The dérive ('drift' in English) was an activity in which the deriveur would wander through the city soaking up its ambiences. The term psychogeography was used to describe the study of geographical settings effects.